Jim Brannan, who recently retired as Cando Rail Service’s VP of Engineering and Track Services, has received the Brandon Chamber of Commerce Community Service Award for 2017. Jim was presented with the award at the 134th Awards Gala on Thursday March 16, 2017 in Brandon, Manitoba. The Community Service Award recognizes an individual or business for outstanding community service to business and community endeavours and for contributing to the well-being of the community as a whole. Jim’s lifelong dedication to his community includes a long list of initiatives and countless volunteer hours. He is currently board chair for Westman Immigrant Services and Servants of Service (seniors housing). Jim has been a member of the Traveller’s Day Parade committee for 10 years and president since 2014. He has also been a UCT member since 1979. 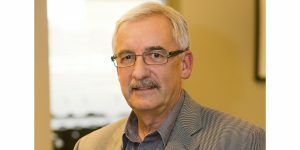 In addition, he is a member of a committee that is currently exploring opportunities with Brandon University on the downtown development project. In the past, Jim was a member of the Premiers Economic Advisory Council from 2011 to 2015. He was co-chair of the oil and gas task group for southwest Manitoba in 2014 and chair of the housing committee task group. Jim was a member of the 2010 City of Brandon aboriginal task group, a past member of the Manitoba Marketing Board and Brandon Chamber of Commerce Board, past chair of the Brandon Community Development Corporation and past board member of the Westman Recycling Council and COR Enterprises. On top of all that, Jim has also volunteered for events such as the Memorial Cup, the Western Canadian Music Awards, Special Olympics and the World Curling Championships. Jim was born and raised in Brandon. He graduated from Assiniboine Community College and received the ACC Distinguished Alumni Award in 2014. Jim joined Cando in 2002 and his responsibilities over the years included new business development, railway contract services and materials procurement and sales in Canada. He was a member of Cando’s Board of Directors from October 2012 to 2014 and is currently filling a second term from 2016 to 2018. Jim retired as VP of Engineering and Track Services in 2014 but returned to the position in 2015 until this past March. As exemplified by Jim, Cando employees have a tremendous amount of community spirit and are busy in the various communities we operate in. The company is proud to support not only our own community service initiatives but those of our employees. For more on Cando’s community involvement, click here.